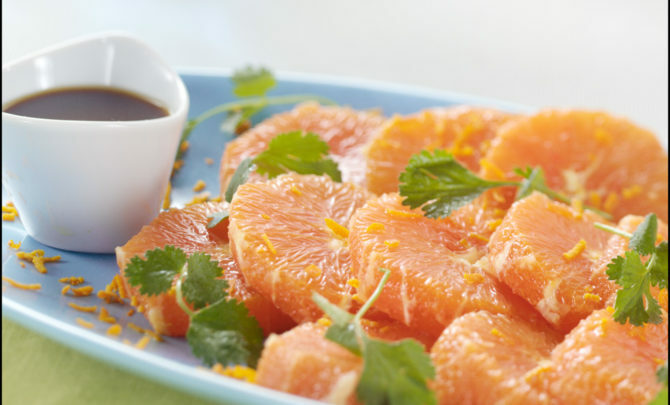 Oranges are full of vitamin C, fiber, and have a calming, sedative effect. A great food for summer to keep cool, and stay calm. With a small, sharp knife, cut peel and white membrane from oranges. Slice the oranges crosswise into thin pieces. In a small bowl, mix 4 tablespoons vinegar with olive oil and sugar. Stir in the mixed spice. In a wide, shallow bowl, gently mix orange slices, onions, slivered mint, and chopped coriander. Pour in dressing and mix gently. Taste and add salt and more vinegar if desired. Scatter olives, mint leaves, and coriander leaves over the top. Spoon salad and dressing onto plates.